The twelve unique, spacious tent houses are located in the midst of a dune landscape. Each accommodation is located in its own hollow in the dunes and has a view of the surrounding nature area or over the rolling dunescape between the accommodations. In addition to the charming furnishings, you will enjoy a relaxing and sociable stay. There is a bedstead for the children (140x2.00m) to sleep in, the heat and cooking are done by a wood fired stove (wood included) and authentic petroleum lamps, candlesticks and lanterns provide a swarm glow after the evening sun has disappeared behind the dunes. If you come back from the beach covered in sand, you can rinse off by attaching the water tank to the outdoor shower. Just pump the water into the bucket, and with one great splash you are squeaky clean. Rather just take a quick shower? There are comfortable sanitary services on the Het Zanenwater Dune Park. There is a "refrigerator" in the form of a cool box, which runs on cooling elements. In the kitchen there is cold running water. 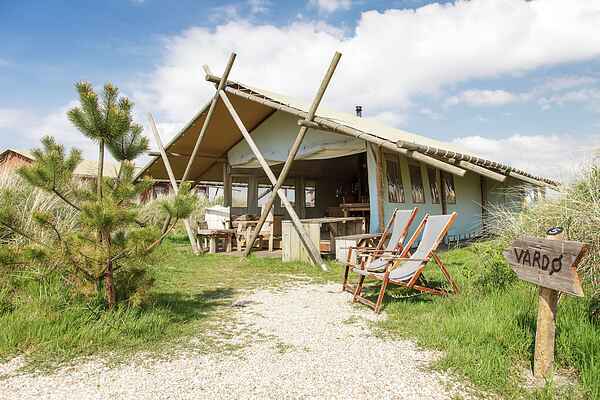 There are two variants of these unique holiday homes; a 6 person variant suitable for five adults and one child up to age 12 (NL-1759-08) and an 8 person variant (NL-1759-09). There is a large playground for childeren on the hoiliday park. One bike and one wagon are standard available at the lodge. The wagon is ideal for children during the walk to the beach.